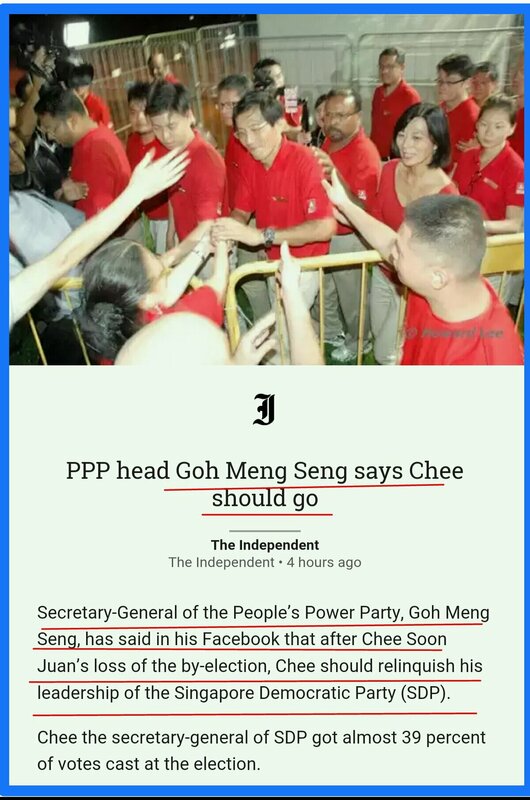 The Independence puts up Goh Meng Seng’s FB article about Dr. Chee Soon Juan; in that Goh asked Chee to leave the political scene because he assesses that Chee would never win in his future bids. It is rather irony (and funny) that a “loser” who had quitted the arena and went to live with his family in Hong Kong and now commenting on a “fighter” who is still “enjoying” his fight in the arena. 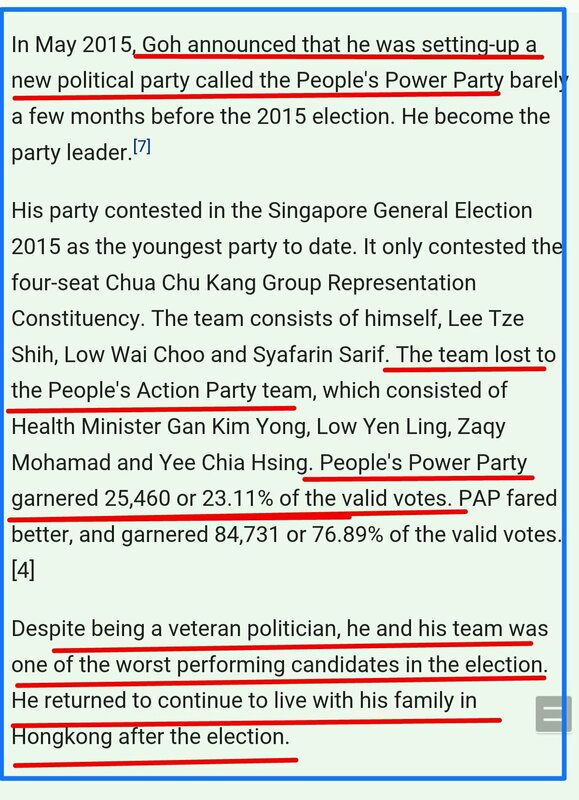 The following brief information (from the web) is about Goh Meng Seng, who lost his fight in the last general election (2015) with only 23.11% of the valid votes, which was one of the worse performing candidates! 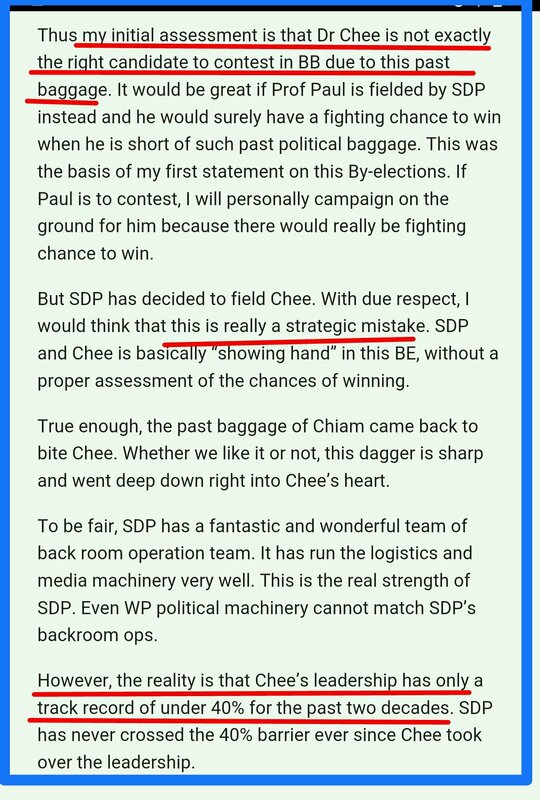 He also feels sorry for Chee who spent 20 years of his prime in the “hopeless” endeavor. 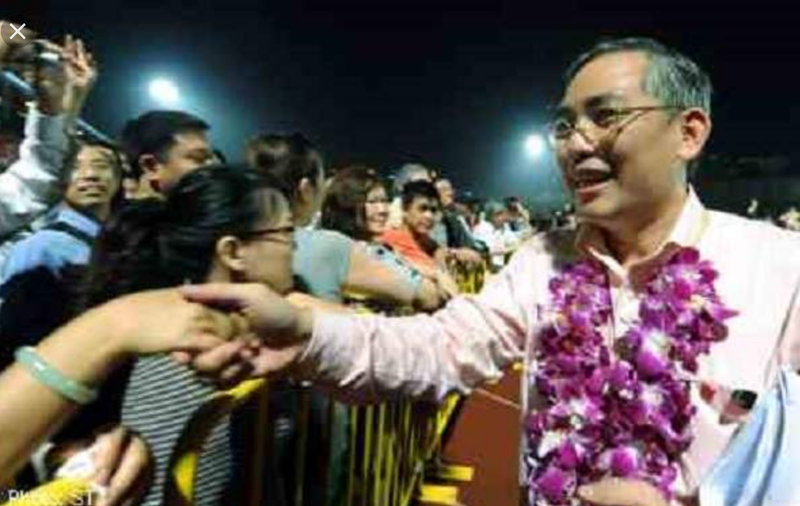 For commoners like us with no political interest, Goh has simply portrayed to the public a profile of himself as a weak character loser. In contrast, Chee emerges a better person who sticks on to his course. As most people observe, Chee and his family seem to be very much enjoying the last two election campaigns (2015 and 2016). Apparently Chee is able to put his past behind him and to a large extend (?) focusing on building up trust with voters. 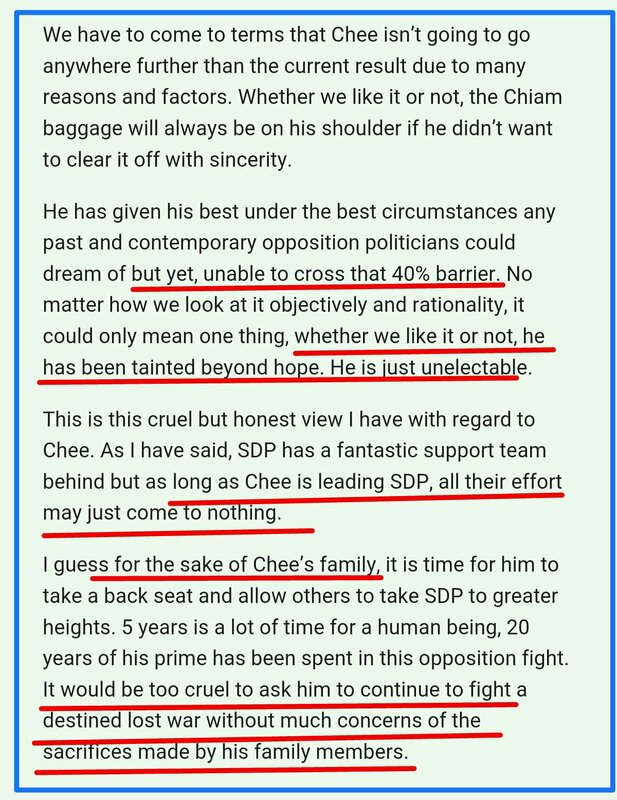 So Mr. Goh, it won’t be “too cruel to ask him (Chee) to continue to fight a destined lost war…” In fact, Chee and his family seemed to spend more time together in the campaign outing! Didn’t Goh see photos of Chee and family giving everybody their happy smiles? The logic here is, don’t try to put your own context and failed experience on someone else. You are not him; your family isn’t his family. The recent Bukit Batok by-election is a good example of proper and fair competition between the two political candidates. While we congratulate the winner of the contest yet there’s no need to rub it in on the other one who put up a good fight. After every election, Singapore remains an inclusive society. One people, One nation. 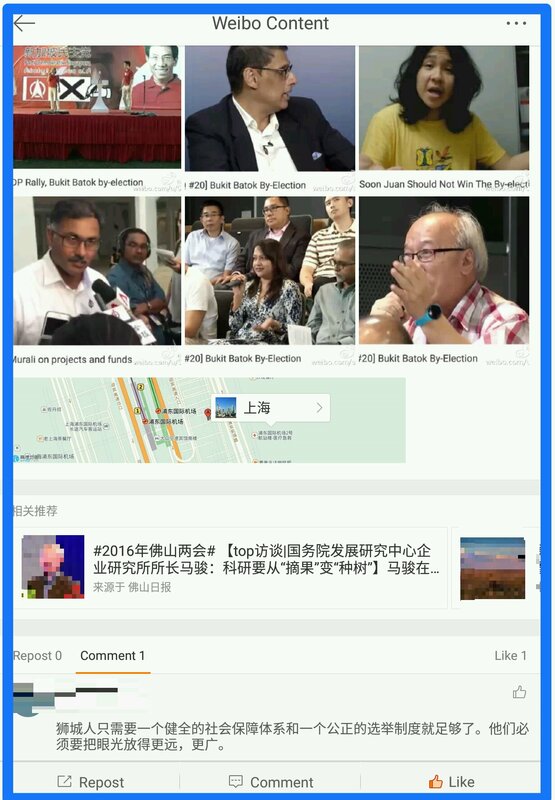 Singapore Elected Presidency Election Criteria ~ Is It On The Right Track? This year in Singapore, there are two important (and highly significant) issues that warrant greater attention by its citizens. 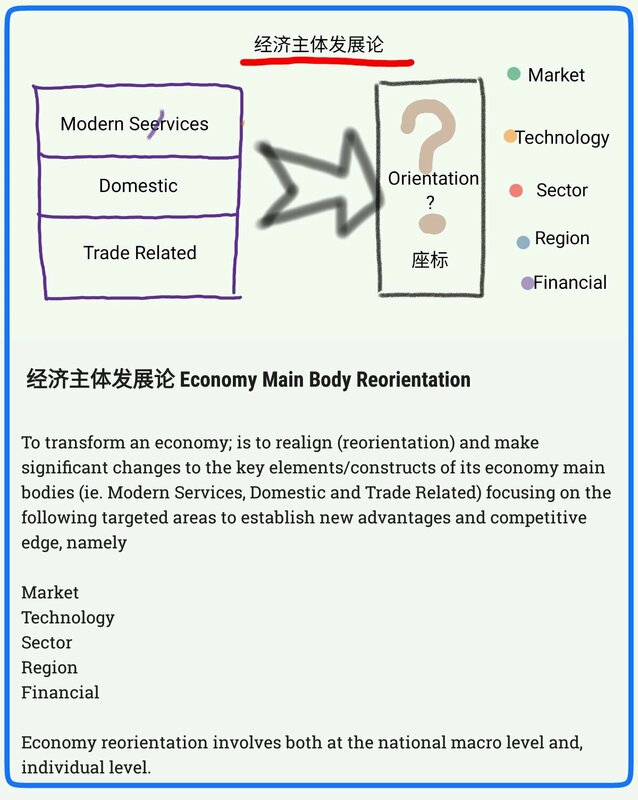 One is the Future Economy (or Economy Transformation); the other is the review of Elected Presidency (Constitutional commission hearing on elected presidency). 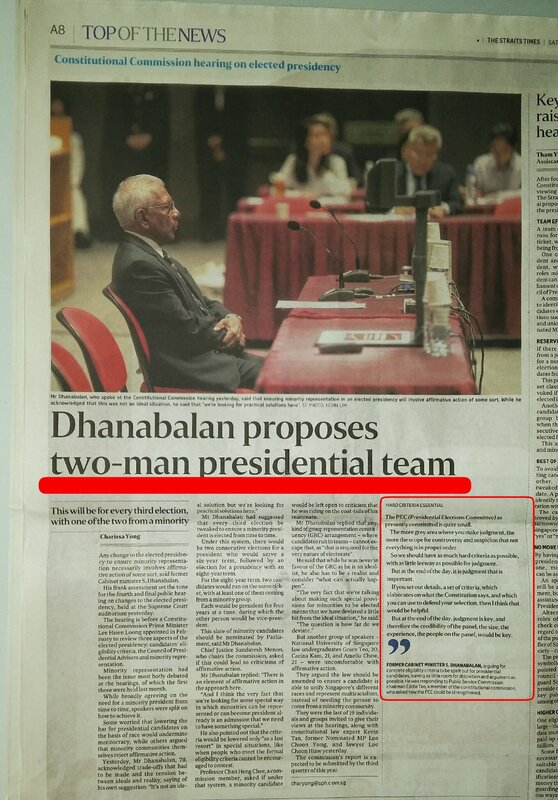 The extracted news report is on the Straits Times today (7 May 2016). 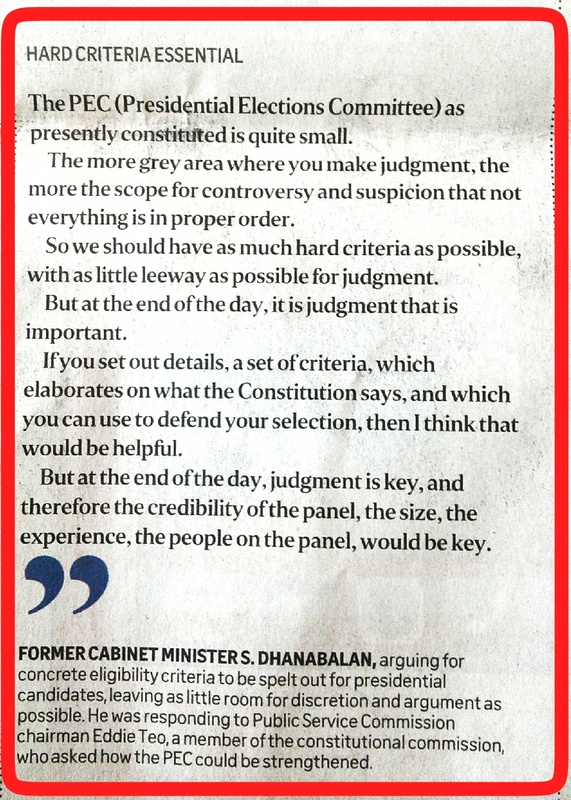 Of all the public hearing group and individual propopsals and arguments so far, ex minister Mr. Dhanabalan’s proposal remains the most interesting one. The NUS law undergraduates group apparently raised pretty sound argument about whether affirmative action should be the way forward. 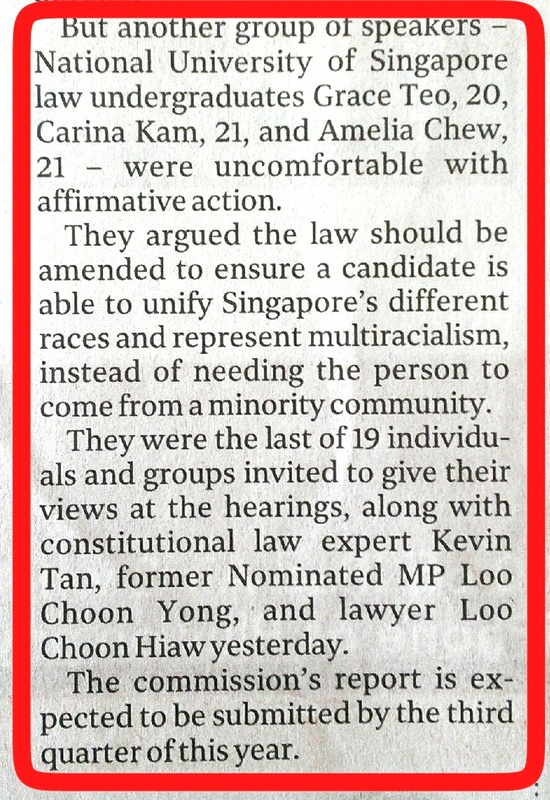 Their central idea of “the law should be amended to ensure a candidate is able to unify Singapore’s different races and represent multiracialism, instead of needing the person to come from a minority community.” should be commended for having the essence of why Singapore needs an elected presidency. ~ should not allow the word Minority to take centre stage of the whole review. Otherwise, we tend to construct a highly rigid mechanism built around the election criteria. And, focus on minority candidates has nothing to do with Unifying The Nation. The logic does not work this way. 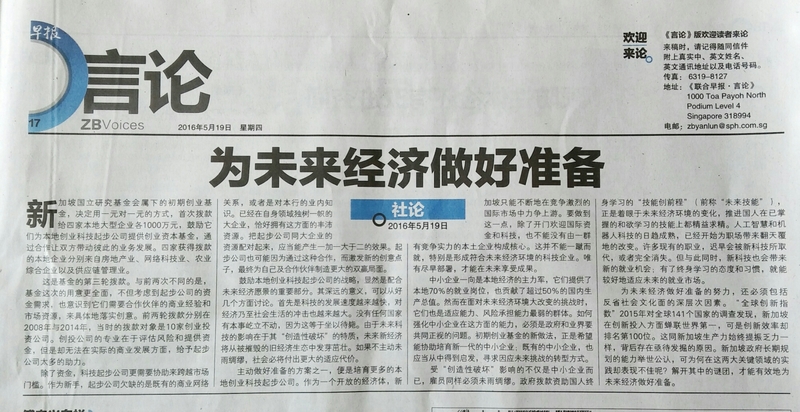 Also, in Singapore we do not have the slightest evidence of if the president is non–minority, the interest and well being of minority community would be compromised. The legislative and administrative power remain with the government in power. Singapore is making progress in Inclusiveness, Community spirit and highly sensible political scene unlike in the long past years. We are talking about bringing the notion of One People, One Nation to the next level instead of going backward. 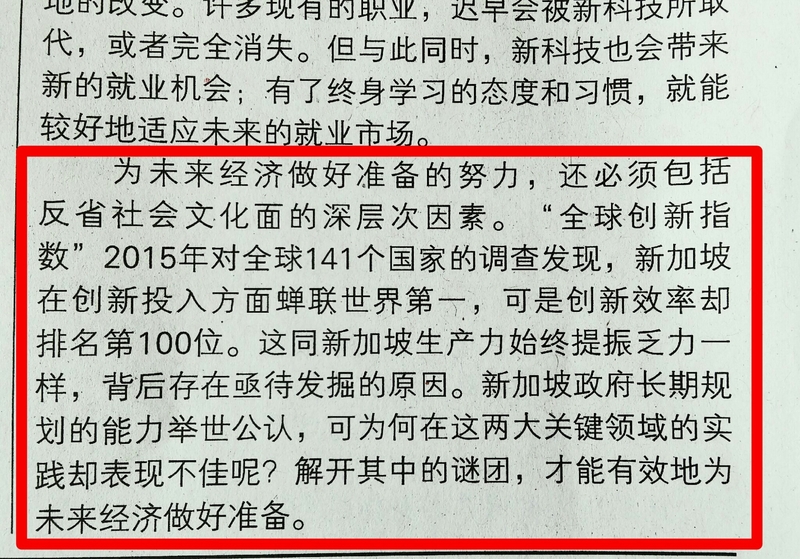 Anyway, minority representation has already long been safeguarded in parliamentary election via the GRC system. 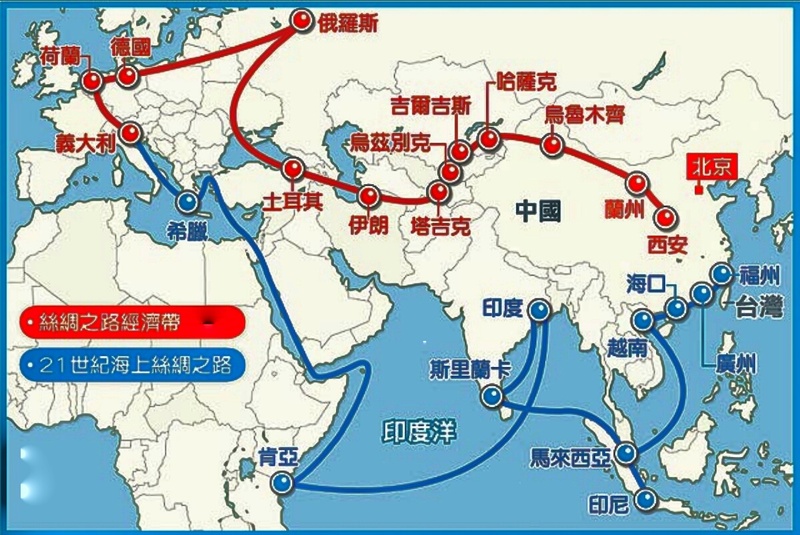 ~ Singapore is at a historical juncture (ie. 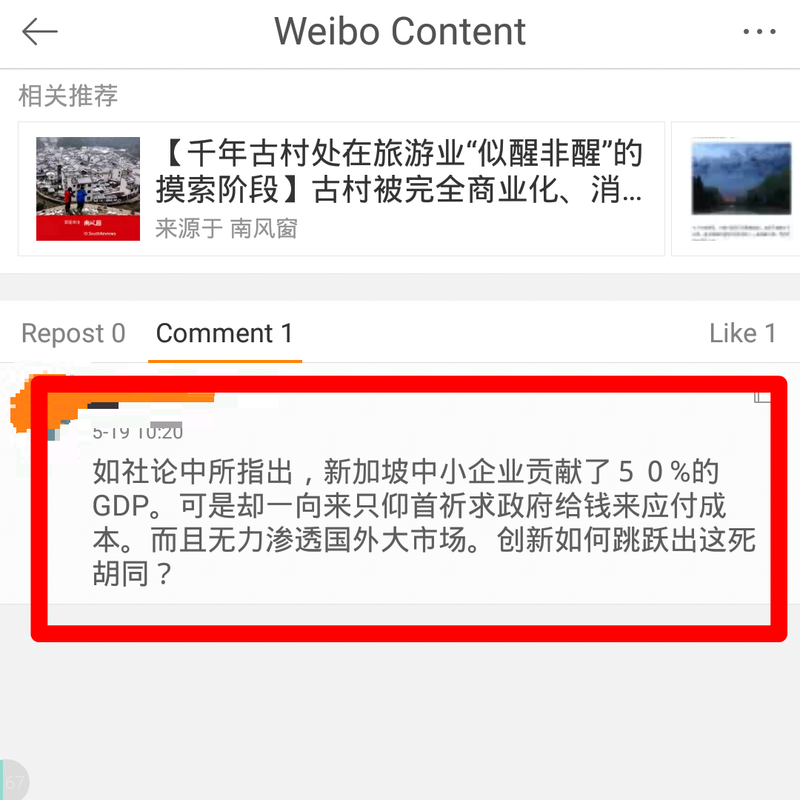 Post Lee Kuan Yew era) as well as at crucial timing, to actively participate in a new world economic and political environment. 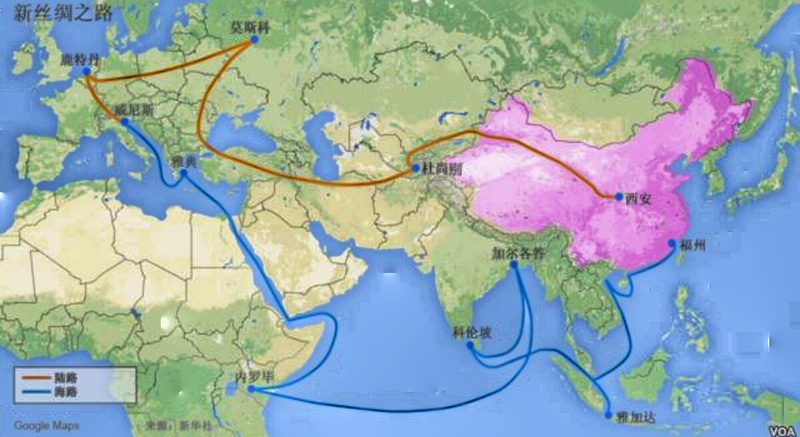 The issues involve regional security, TPP (Trans Pacific Partnership), terrorism threats, China’s trade initiative (一帶一路) and, how does Singapore able to dovetail with those initiatives that can help us to regain regional competitiveness as well as economy transformation; and to bypass or minimise impact of those issues that will destroy our strengths. Hence, more strategic thinking and new insights should prevail. It is therefore highly detrimental for the nation to develop itself into a fixed mindset and engrossed in Hard Criteria and that such approach becomes the Only prevailing principle. Elected Presidency review should not easily fall for such syndrome and easy way out. ~ should not turn a relatively simple election system into a complex one. Currently the elected presidency system is supported by Council of Presidential Advisors, Presidential Council for Minority Rights and various governmental agencies when the needs arise. The president is not a Superman operates on his own or making his judgement within a box. Therefore, to try add on more “super-waterproof” or hard criteria that ensure an elected president will do a “perfectly” good job is unnecessary. This has nothing to do with essence of pragmatism as our founding father who took it at heart. This approach is more of a mentality driven by fear of failure and hence, trying to “lock-in” and safeguard all possibilities. ~ should not be overly excited to jump into conclusion of focusing on ‘Right Experience’ (for elected presidency). This notion carries tons of idealistic and wishful thinking but we all should know that it won’t work in the real world unless the elected presidency job is simply a plumber or car mechanic or airline pilot captain etc. etc. What’s Right Experience? A heavyweight CV and corporate job that manage billions of dollars worth of asset? 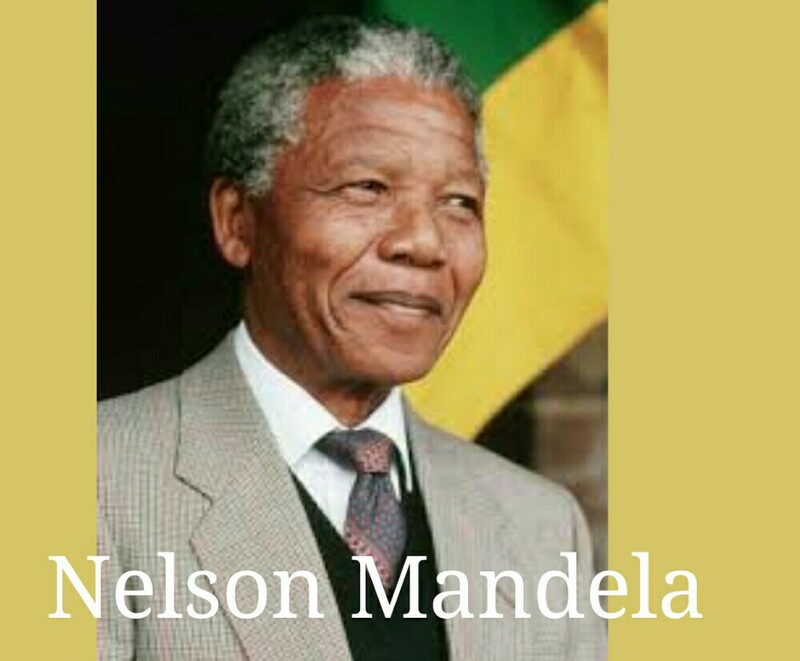 If truly there’s this so called ‘Right Experience’ magic stuff for high political or national office, then Nelson Mandela would never become the most respected president of South Africa and the world. His experience (including 27 years in prison) and CV would not even qualify him to be called up for first round of interview by the Presidential Election Committee! We should not be driven by fear (and trying to cover all sides and be perfectly safe); but rather look beyond the horizon. Because that’s where Singapore Dream lies. 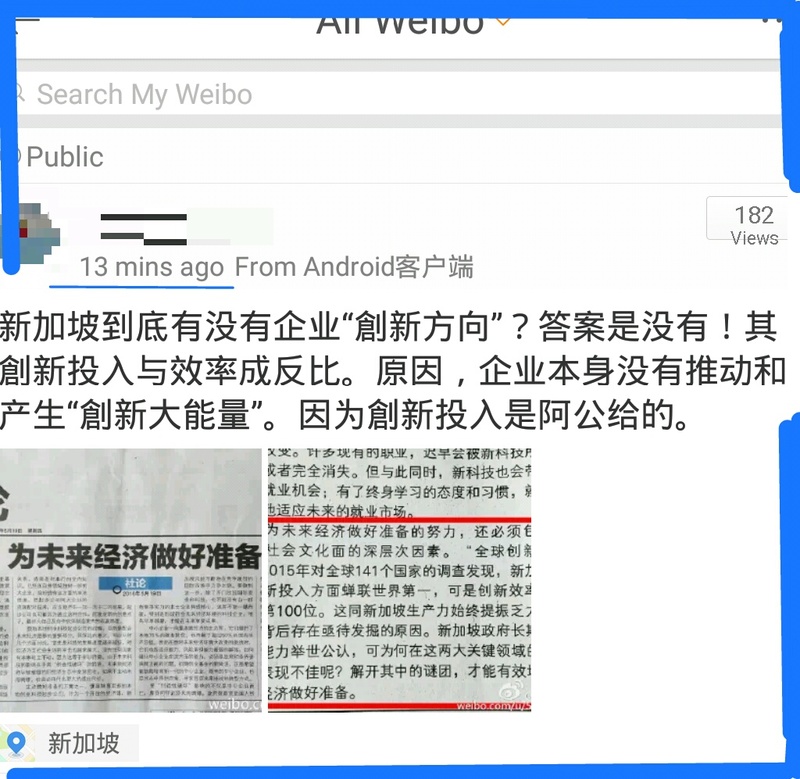 真正关键的是狮城人有必要再反思李光耀的务实精神，真正要聚焦的是，经济转型 的大挑战是如何可以達到的？在这未来十年里，如果没有达到全民投入的程度，单是依靠政府单方面资助是无法成功的。无论是从经济主体 (Economy Main Body) 改革或是个別的产业鏈 (Sector) 转型/創新环节來看，其过程都离不开 政府～民间企业～生产个人 之间所须並发的总和大能量，总协调与开放的創新大环境。(ie. 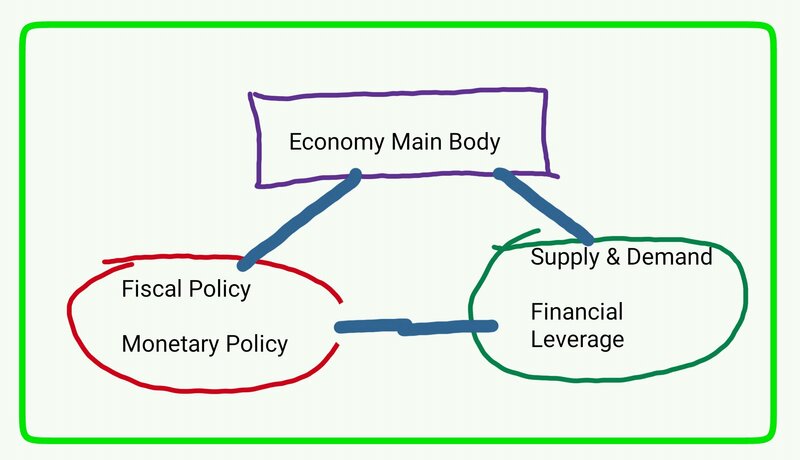 Greater synergy and impacts).